Produktinformationen "AQUA SPEC AQ 40S - Rettungswesten Notblitzer"
To operate the light manually, press the button at the front of the unit. 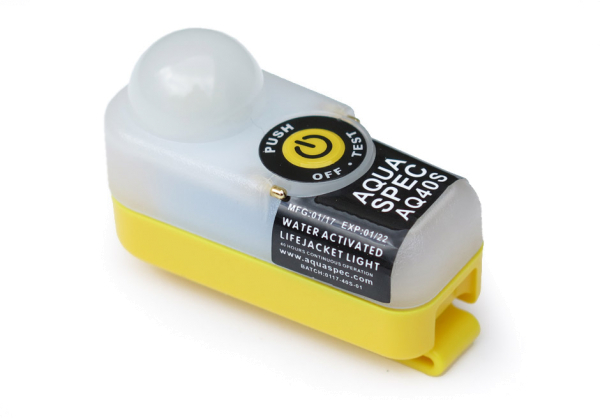 The light must be secured to the lifejacket in a position that provides maximum visibility when the wearer is in the water, preferably near the shoulder. The sent strip of nylon material is intended to fix the AQ 40S with the clip and then thread it on the mouthpiece of the manual inflator. Weiterführende Links zu "AQUA SPEC AQ 40S - Rettungswesten Notblitzer"